MediaKit was developed for the makers of shortcuts. You spend hours of time to create and develop shortcuts. You shouldn't spend another hour or more presenting your work. 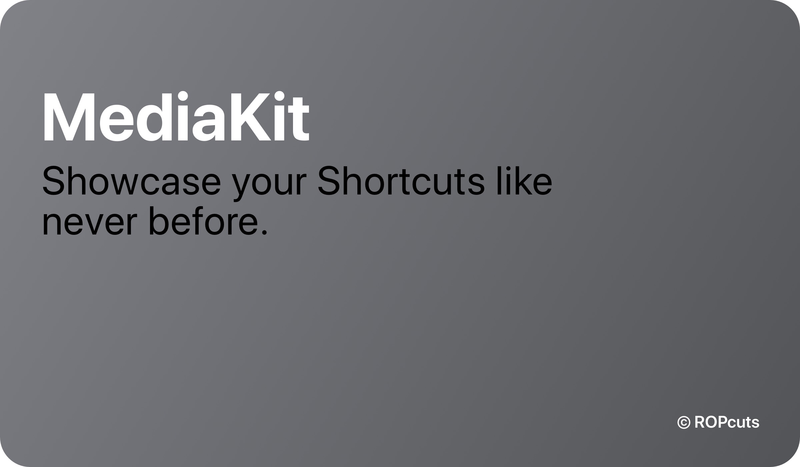 MediaKit offers you everything you need to showcase your shortcuts (especially here on RoutineHub). Create banners with the background color of your shortcut, the name and a short description or a slogan to introduce your shortcut. 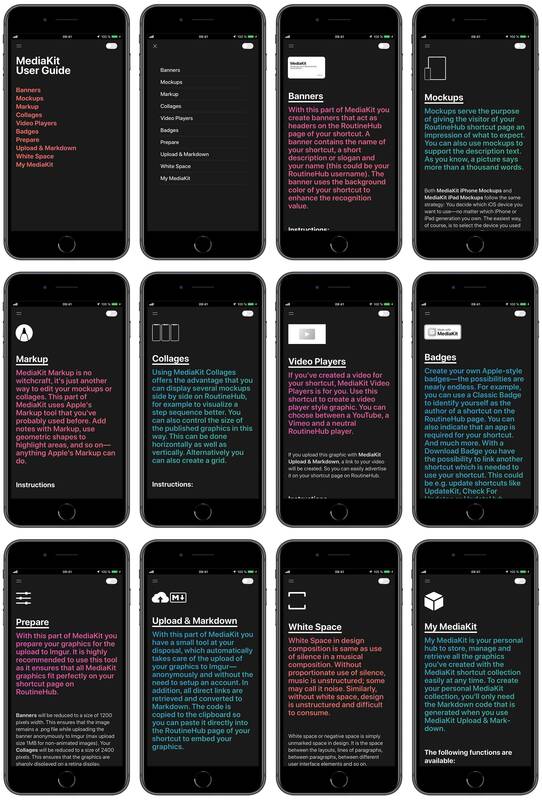 Generate mockups with your screenshots and the frames of 50 iPhone devices. Generate mockups with your screenshots and the frames of 34 iPad devices. After you have created your mockups, you can merge several graphics into one. You have the choice to arrange them horizontally, vertically or as a grid. You have created a video for your shortcut and want to link it with highest attention? Create a YouTube-, Vimeo- or RoutineHub-Player with or without a video poster and link the graphic to your video. Create your own Apple-style badges, for example to draw attention to which app is needed to use your shortcut. Or link another shortcut which is needed to use yours. You can also use this feature to show that you are the author. With My MediaKit you always have your personal MediaKit collection at hand. Store and manage your graphics and retrieve them easily at any time. MediaKit Markup is no witchcraft, it’s just another way to edit your mockups. This part of MediaKit uses Apple’s Markup tool that’ve probably used before. Add notes with Markup, use geometric shapes to highlight areas and so on—anything Apple’s Markup can do. Prepare your graphics for uploading to Imgur and embedding on RoutineHub. This guarantees that all MediaKit graphics have an accurate size and fit perfectly into the RoutineHub page of your shortcut. MediaKit offers you the option to upload your graphics directly to Imgur. Images on RoutineHub are embedded with Markdown. MediaKit also takes care of this part for you. The code you need to embed images with Markdown is automatically generated from the direct links to your graphics. This code is copied to the clipboard so you can paste it directly to the RoutineHub page of your shortcut. The same goes with linked images like Video Players and Download Badges. One of the most important things in design is white space. MediaKit offers you five different sizes to optimise your RoutineHub page layout. Explore how to use MediaKit with a built-in User Guide. Important notes: All Shortcuts have been tested intensively and over a longer period of time. Test devices were iPhone XS, iPhone X, iPhone 8 Plus, iPhone 7 and iPhone 6s Plus, iPad Pro 11, iPad 9.7, iPad Air 2, iPad Mini 4. All devices had the current iOS version and the current Shortcuts app version at the time of the test. Special thanks: Special thanks to Adam Tow for improving the performance. MediaKit 1.2 runs faster than ever before. Thanks a bunch! 1.2 - March 29, 2019, 9:34 p.m.
Looks awesome! How did you bold the text in the alert that displays the first time it’s run? I’ve been wanting to do that whenever. I went in too look at your fancy coding, but the very text in the text box was bolted, and I’m at a loss as to how you did that. If you could pass on your wisdom, I’d be a very grateful padawan. Awesome! Thanks for getting back to me. I just tried to set the icon of a badge using one of my shortcut icons, and it worked the first time, but I didn’t like the color. After changing it, the icon doesn’t appear on the final badge. Any suggestions for the fix? Amazing!!!!. You should be named Best Shortcut Creator of 2019!!!!! Well worth the wait! Already made some for my shortcuts! Amazing job! Hey, thank you sooo much. Makes me happy to see you’re already using it. I love this shortcut, you make quite a lot of cool shortcuts. BTW, how do I add the Badge to RoutineHub Descriptions? Use the Upload to Imgur action and then paste it into your shortcut description. Hello, Tony, I hope you're all right. Thank you very much for your kind words!!! Is it now my bad luck or my luck that it is only February...? ;D And yes, of course you are absolutely right with the landscape orientation. It's just incredibly time-consuming to implement this for all iOS devices. But it is planned. ;) Have a nice evening. Btw: Next week I finally have more time again. I'll get back to you. All my best! Congratulations on all the work you've done. One of the best shortcuts I've ever tested! I love this Shortcut, it would be great to see an option to create badges with a “download” button attached. Is it possible to make Mockup horizontally (for the iPad for example)?